*** Note - this cable WILL NOT fit the earlier PR System One 50 Series CPAP / BiPAP Machines, Model No DS200, DS250, DS450, DS550, DS750, DS950. It will not fit any of the earlier versions of Respironics cpap or BiPAP units either. 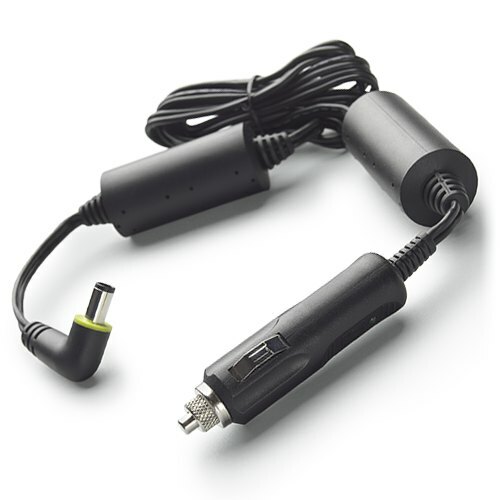 This power cord is used to connect a Philips Respironics DreamStation or Philips Respironics 60 Series CPAP or BiPAP machine to any 12-volt receptacle, such as an automobile cigarette lighter socket. Use this item to make traveling or overnighting in your car, boat or RV possible. Length is 6 feet. Received order promptly at a very good price. Tested it in my RV and it works. Will get a better test when we go on the road for a month or two this summer. The power cord is exactly what I needed and is working perfectly. I use this cable to power my Respironics CPAP in my motorhome. In my actual testing, it's about 15 percent more efficient to use a direct 12 volt dc cable like this compared to using an inverter. (Note also that most CPAP machines and many other sensitive electronic products will not work with the cheaper square-wave inverters; they'll only work with the more expensive sine-wave inverters.) This efficiency is especially important when dry camping using just batteries and solar power. This cable is heavy duty and high quality and a good value. So far I am completely happy with my Philips Respironics DreamStation 12-V DC Power Cord. I have used it two nights while camping with an external 12 V battery and it has functioned perfectly. My wife uses a CPAP machine. Every now and again during the winter we lose power. Sometimes it happens in the middle of the night. We purchased an (expensive) battery back up for her but it didn't come with a DC power cord. I had to go on line and found what I needed at bestcpapprice.com. It shipped right away and we received within a week. As soon as we got it I plugged it in to the battery back up and it worked just great. I'd recommend them to anyone needing CPAP Supplies. I ordered the 12 v plug for my husbands dream machine. He is a truck driver and was using a converter before. The company he got his machine from didn't carry the 12 v plugs, so I ordered him one through your company. It has been a life saver as he don't have to worry as much about draining his battery. Thanks for the great service and quick shipping. works great, at the best price out there. Just what was needed to use in my camper van. No more noisy fan from the inverter to power the Dreamstation unit. Works just like at home with this cord. Item worked perfectly with my cpap. I used it this past weekend in my camper on an elk hunt. Sure was nice not having to use my generator, friends appreciated it as much as I did. Great price and I will probably order another to have as a backup. Works just great, thanks for the prompt service. This adaptor allows me to use my CPAP machine for camping or when there is a power outage. Thanks to Tony for helping find the correct adaptor. I must give this five stars. I was impressed with the quality of the construction. I have confidence it is shielded to protect my Bi-pap machine. I used this for a four night camping trip and ran it off a lithium ion battery with no problem. This was exactly the same product from Respironics that I would have otherwise paid $65 for from my local supplier! It even had a one page manual with it that ended up being heavier than the product because of all the languages it was printed in! Power cord worked great, connected to a 12v 100AH deep cycle battery, separate from my vehicle battery. I went camping for the first time in years and slept really well. A good price and fast delivery... I understand the purpose of magnetic choke coils is to protect electronic equipment from voltage and current spikes. The choke coils on this power adapter are massive. Item delivered promptly and was the best price over the Internet. OEM product in OEM packaging. Very happy. Q: Will this cord fit Respironics System One REM Star Auto 560P ? Q: Will this fit Philips 550p? Q: Will this item fit my DSX500H11C? A: Yes, this is the correct DC cord for the any of the Philips DreamStation machines. It will also work with the System One 60 series machines (NOT 50 Series). Q: Will this fit my Philips Respironics DreamStation DSX500T11 ? A: Yes this DC cord will work with all of the DreamStation cpap and BiPAP machines. It will also work with the System One 60 series machines. It will not work with the System One 50 series. Q: Do I kneed a prescription to purchase a 12v power cord for my machine? A: No, anything that requires a prescription states that an Rx is required on the product page. You also have to check a box and acknowledge how you will send the prescription. Q: Does this unit work with the philips Respironics REMstar Pro c-flex system 1 ? A: Maybe, there are two different versions of the System One a 50 series and a 60 series. Look on the bottom of your cpap (not the humidifier) and there is a plate that will have a REF #. If it says 460P its a 60 series and yes this cord will work. If it says 450P its a 50 series and you will need part #1001956.